Sechuran Foxes are the smallest species of fox in South America. They have a body length between 53 and 59 cms (21 - 23 inches), a tail length of approximately 25 cms (10 inches), and they weigh around 3 kgs (6.6 lbs). They are grey in colour with a paler underside. 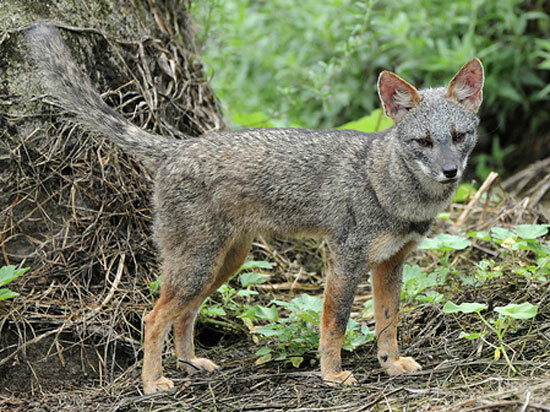 Sechuran Foxes can be found in the grasslands and semi-arid areas of north western South America. Sechuran Foxes mainly feed on rodents, birds, insects, seeds, and carrion. Nothing is known about reproduction in Sechuran Foxes. Predators of Sechuran Foxes have not been documented. There are no subspecies of the Sechuran Fox. Sechuran Foxes are named after the Sechura Desert in Peru.